Cough and Sore throat remedies don't have to come from the drugstore – quick and easy relief may be right in your pantry. Sometimes sore throat pain is just caused by winter dry air; sometimes it's linked to a cold, flu or other virus. 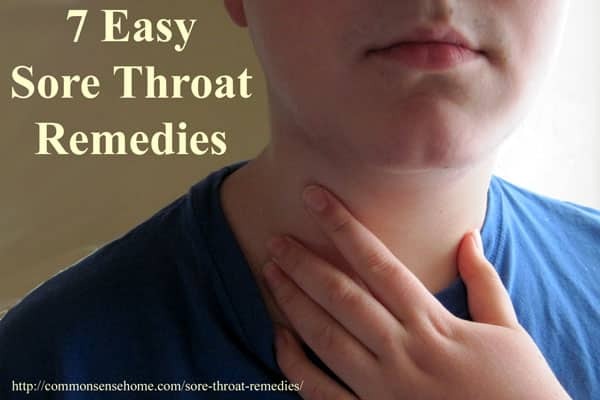 Whatever the cause, these home remedies can help relieve throat pain and speed healing. Remember – If pain is severe or persistent, is accompanied by high fever, bleeding or trouble breathing, please see a trained health care provider. Take care of yourself and get help if you need it. To use cayenne for sore throat relief, use a glass of warm water and add from a few sprinkles to 1/2 teaspoon cayenne powder to the water. Gargle with this water several times per day, or as needed. You may also add 1/4 teaspoon of sea salt. Depending on your spice tolerance, you may use more cayenne, but I think it's best to start with lower amounts and work your way up as needed. Please note that cayenne may interact with some prescription medications (see cayenne interactions), so do be careful if you're on meds. If you're battling bacteria or a virus, it can throw your throat pH out of whack. A warm salt water gargle can help restore the proper pH levels, easing sore throat pain. The warmth also acts to relax tight, aching throat muscles. Use 1/4 teaspoon salt per 1/2 cup of warm water, and gargle several times per day. As mentioned in the post, “The Best Vitamins and Minerals for Fighting Colds and Flus“, zinc interferes with the ability of rhinoviruses, which are responsible for most colds, to reproduce and lock on to cells. In a Dartmouth study of zinc cold lozenges, “cold duration was an additional 4.3 days in zinc-treated patients compared with 9.2 days for placebo-treated patients. Cough, nasal drainage and congestion were the symptoms most affected, and only mild side-effects were noted.” Patients used up to eight zinc lozenges per day. Just to note – these taste a little funny, but they've been proven to work. Combine vinegar and salt in a more tasty package, and you have pickle juice pain relief. Some folks swig it right out of the jar (this isn't very hygienic if you're sharing your pickles with others – don't share the sore throat funk), others gargle from a glass. Warming it up a bit gives the muscle relaxation mentioned earlier, but it may taste a bit less palatable. If you have a nice fermented pickle like raw sauerkraut juice, which also contains vitamin C and probiotics, all the better. 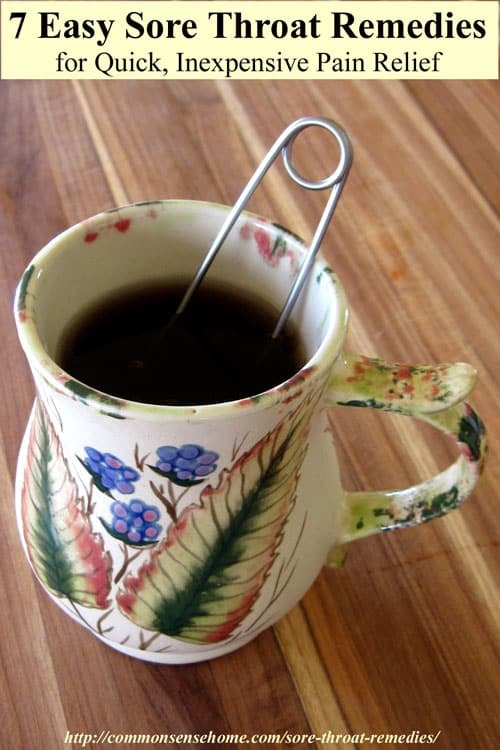 Any warm liquid will help, but other cold busting tea ingredients to look for include rose hips, which are high in vitamin C; elderberry and echinacea, which are known virus fighters; or cloves, which contain eugenol, a natural numbing agent. The 2014-2015 flu season is making headlines, starting earlier than expected and landing more folks in the hospital. CDC Director Dr. Tom Frieden has stated that “Unfortunately, about half of the H3N2 viruses that we’ve analyzed this season are different from the H3N2 virus that’s included in this year’s flu vaccine.” Viruses mutate, often quite quickly, so this is not uncommon. It does mean the flu vaccine may be largely ineffective (but is still recommended by the CDC). I know a number of friends and family have been sick already, some with symptoms that hang on for weeks. So far, knock on wood, we've been clear, and I've been dosing our family with probiotics and other immune boosters and we enforce strict hand washing. Have you been ill this cold and flu season? 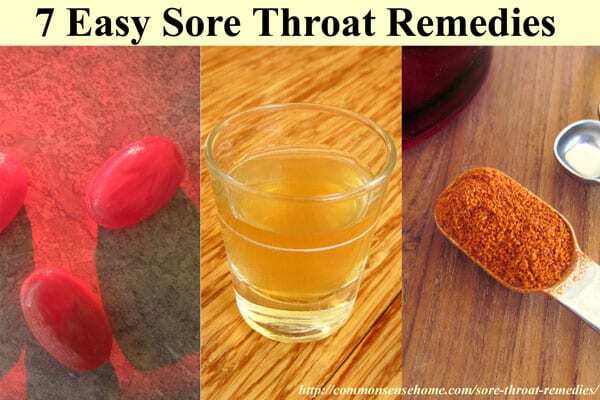 What do you use to treat sore throat pain? Comments and social media shares are always appreciated. Thanks, Linda. I’ve been working my way through them this week, as the cold dry air is making my throat all scratchy. This couldnt have come at a more perfect time. I just woke up with a scratchy throat and found this post on my inbox! Thank you for taking the time out of your day to write this up. You’re welcome, Kayla. Mine has been scratchy this week, too, but it’s better today – and I think we may see temps in the double digits above zero! My go-to for when I feel like I’m getting sick is to immediately take vitamin C and zinc. Every hour, if necessary. I take it in water that I put echinacea tincture in. I then take a shot of either my homemade Fire Cider (find the recipe from Rosemary Gladstar on Mountain Rose Herbs blog) or my homemade elderberry syrup. When a co worker got back from a cross-country flight and was instructed to work with a 103* fever, I also added ONE drop of oil of Oregano to all water I drank. I regularly use oregano, cilantro and turmeric in my cooking, as well as onion and garlic. I have not been sick for years! I try to eat as much organic as I can, don’t use commercial cleaners or makeup but make my own. I don’t consume HFCS, ANY soy, or corn (corn, unless its non GMO and organic), and get plenty of sleep. I NEVER get shots for flu or any other illnesses, as they are worse than the malady, and according to alternative news, the don’t work! I know this is long, but I feel that it may be beneficial to someone who is sick a lot, and would really like tips to be healthier. I especially like the idea of drinking the ‘juice’ from sauerkraut (or pickles, but the S. would be more beneficial due to the probiotics in the fermented ‘kraut). I have a thieves vinegar recipe on the site that is somewhat similar to fire cider. Plenty of spice! As you’ve mentioned, there are many, many ways we can boost our immune system naturally without the harsh side effects of pharmaceuticals. Study conducted by Andrew Weil of the University of Arizona College of Medicine proved that garlic can strengthen the immune system, stimulate employment by T cells in charge of fighting infection. People with chronic infection are encouraged to consume raw garlic 1 to 2 cloves every day. This can be found written in Natural Health, Natural Medicine. I love number 5 – the pickle juice – I’ve never thought of that! My home remedy is at the signs of a sore throat I put on a scarf and wear it until it goes away. As a chronic sufferer I’ve found this has help prevent it developing to something more that a scratchy throat a lot of times.